A spacious 2/3 bed penthouse with huge wrap around terrace within the luxurious Seaflower development close to Miraflores Golf club house in Mijas Costa. The property has a lift directly into the apartment on the upper level into the lounge area so the current owners have utilized the hall way on the original entrance level as a 3rd occasional bedroom/study. The property is extremely well presented and will appeal to buyers looking for that little bit of extra interior and exterior living area. 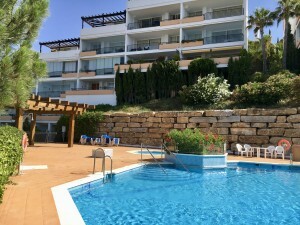 Penthouse, Mijas Costa, Costa del Sol. 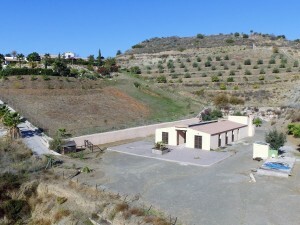 2 Bedrooms, 2 Bathrooms, Built 137 m², Terrace 113 m². Setting : Country, Close To Golf. Orientation : North, East, South. Views : Sea, Mountain, Golf, Country, Panoramic. Features : Lift, Fitted Wardrobes, Private Terrace, Satellite TV, ADSL / WIFI, Storage Room, Ensuite Bathroom, Marble Flooring, Double Glazing.